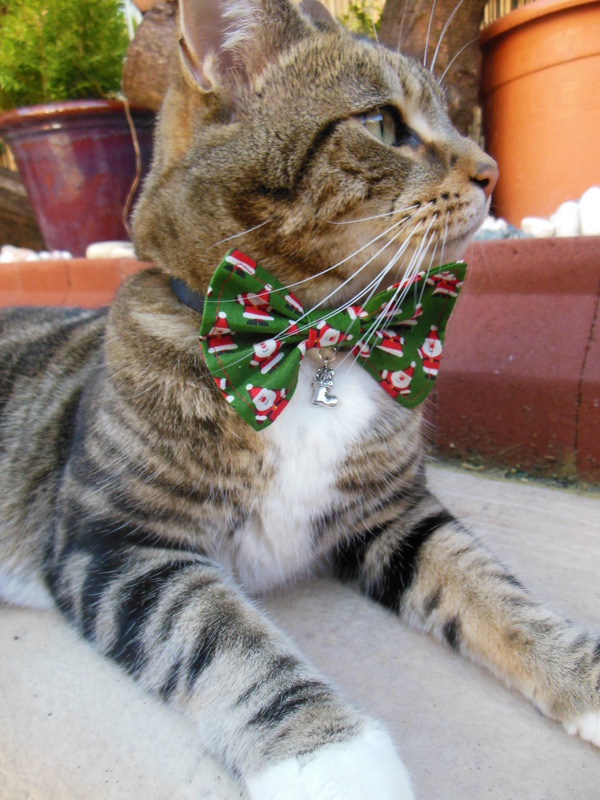 ‘Tis (nearly) the season to be jolly and merry and don’t forget to include your festive felines this year! 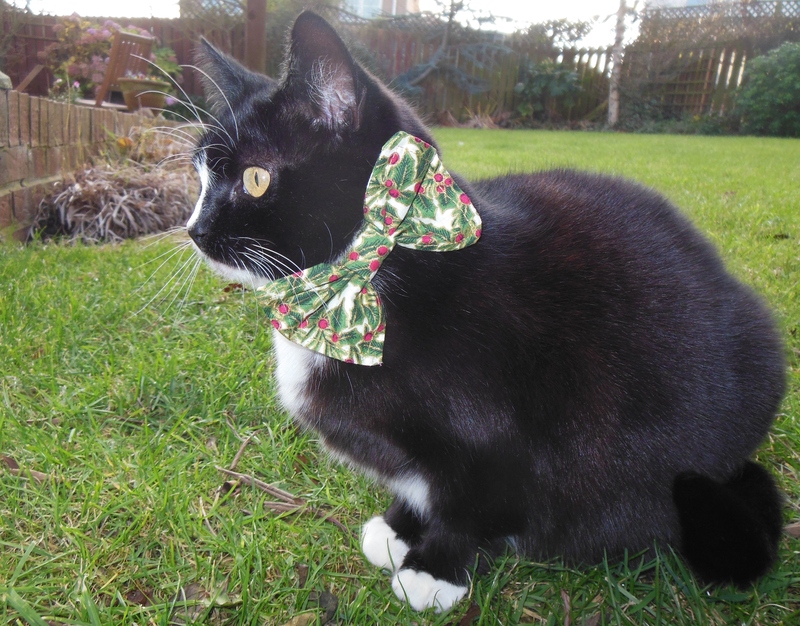 These Christmassy bow ties are just purrfect for your little ones (and can be bought from our Etsy shop). All of the collars are handmade (by me!) and are fully adjustable and feature a safety breakaway buckle so your cats can go off on their adventures without worry of getting stuck anywhere! 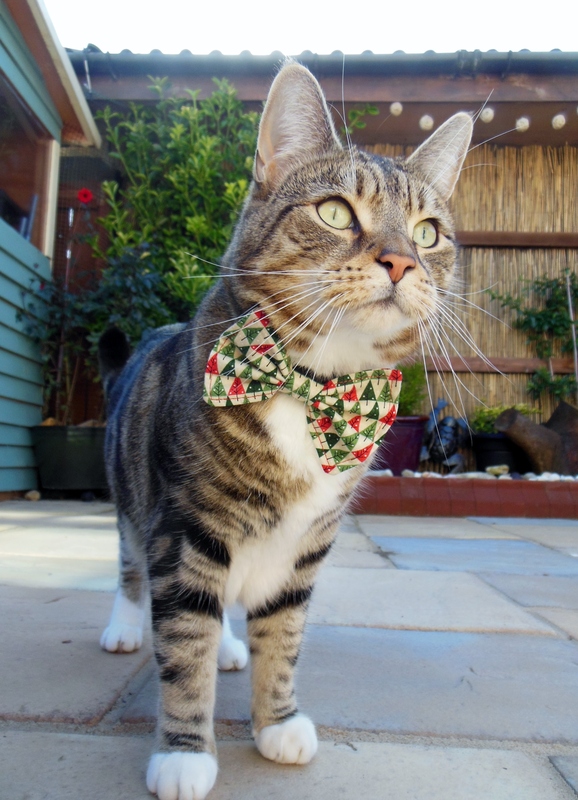 The bow ties are made of light weight cotton so won’t slow them down either! 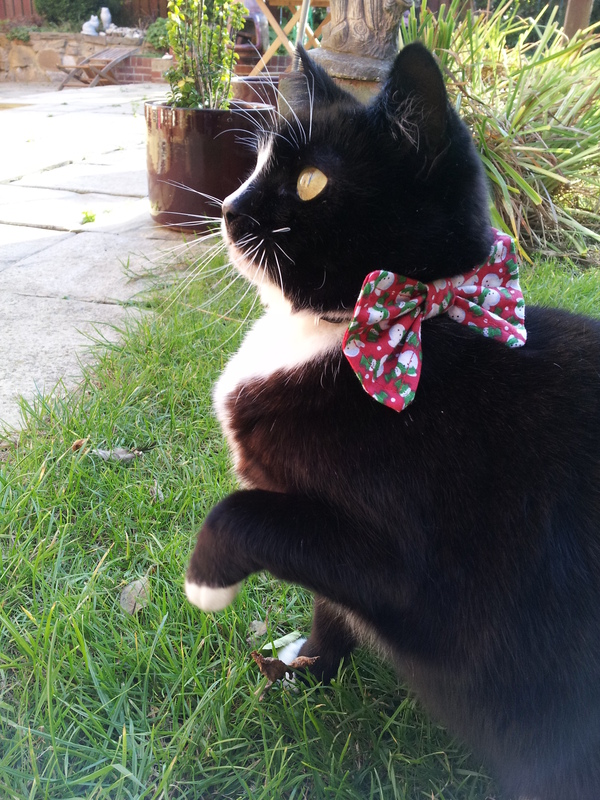 All bow tie cat collars have a lucky charm (snowmen, stockings, reindeer or Christmas trees to name just a few!) dangling from a split ring where you can attach your cat’s ID tag. Boop is excited for Santa Claws! There are some more designs in my online shop but I just wanted to show you a few of my favourites. And I’d best say a big thank you to Lyla and Boop for being very patient and modelling so well – mind you, they love having their photographs taken! I love my two little moggies, Lyla-cat and Boop, more than any fluffy thing in this world. I can’t imagine life without the two of them, being silly and filling my life full of surprises (and cat hair). Meeting so many cat owners means we chat about all things cat – and something that pops up from time to time is how to really treasure the memories of your four legged friends, whilst also having something you really love. 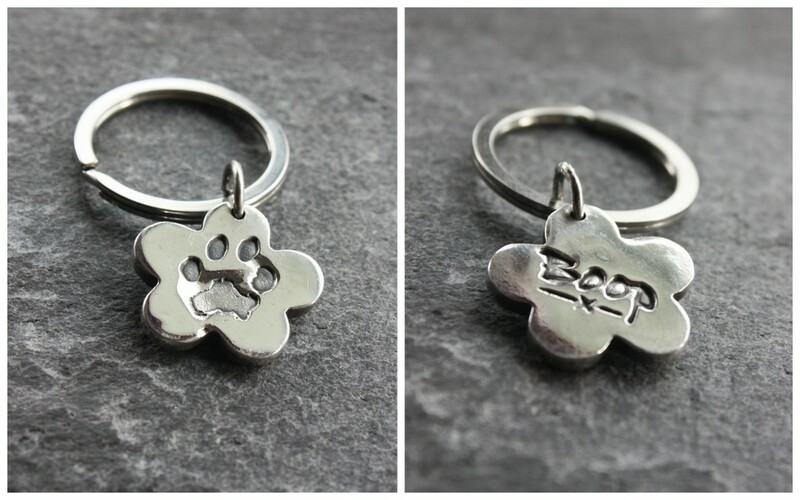 I came across the idea of turning your best friend’s paw prints into a keepsake, something that can last forever after their time with us has gone. 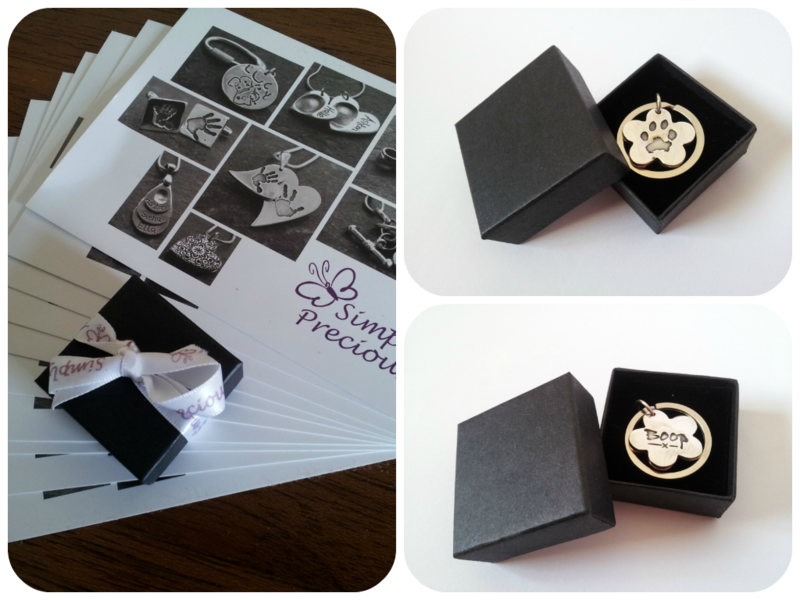 I was introduced to Simply Precious – who make beautiful personalised 99.9% silver jewellery. They have a special technique of capturing foot prints and finger prints, making lasting memories for babies and children – and now rather excitingly for me – paw prints! 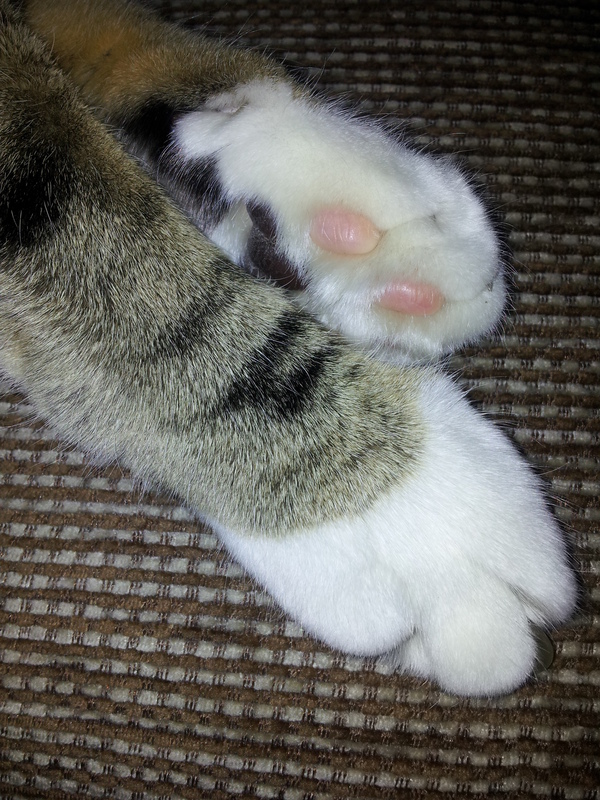 Boop’s little feet – so cute! After purchasing from their fabulous website, I received an impressions pack in the post very quickly – which was great as I was keen to get started! I was a bit nervous as I get a bit panicky when reading instructions, but luckily the first part of my letter from Kelly at Simply Precious said ‘don’t worry, further kits can be supplied’ – brilliant! (though I still read the instructions a further five times). As recommended, I waited until warm, fuzzy, sleepy afternoon Boop was in a ‘calm’ mood and set up my ‘paw print’ station in the kitchen; I sellotaped the transfer paper to the kitchen table so it wouldn’t move. I checked that Boop’s paw was clean and dry. I roped in my husband for an extra pair of hands. I prepared a mug of warm water and cat shampoo, ready to dip Boop’s paw in afterwards. And then finally, I got the cat treats at the ready! In the end I needed all three sheets of the special printing paper as I got a bit confused! 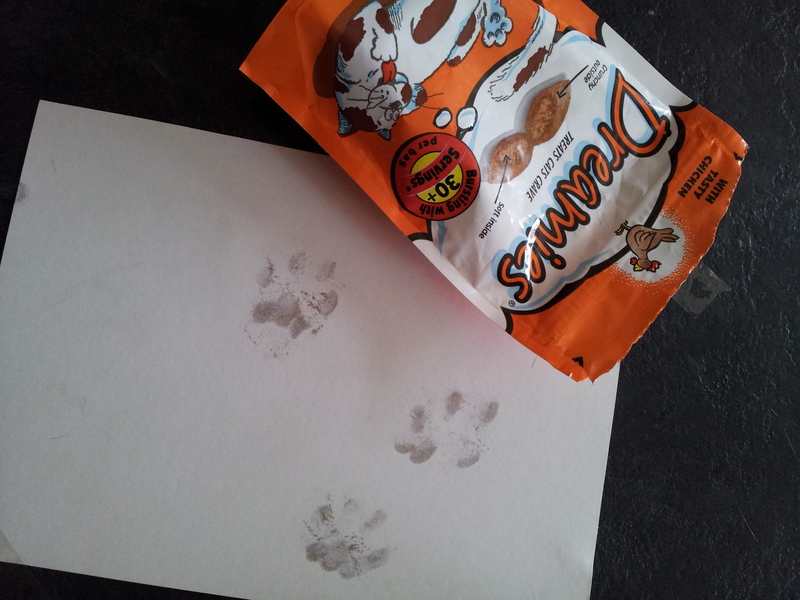 At first I wiped the paper instead of Boop’s paw print, and then I managed to squidge my own fingerprints all over the second piece of paper *groan* so third time lucky! … I wiped Boop’s paw, plonked him on top of the third sheet of paper (extensive bribery by this point) and kept my fingers crossed that the prints would be good enough! Ta-dah! The process isn’t the slightest bit messy, as you use an ink-less wipe (magic) but afterwards I put Boop’s paw into the cup of cat shampoo to make sure he was nice and clean and he trotted off quite happily with a tummy full of treats. 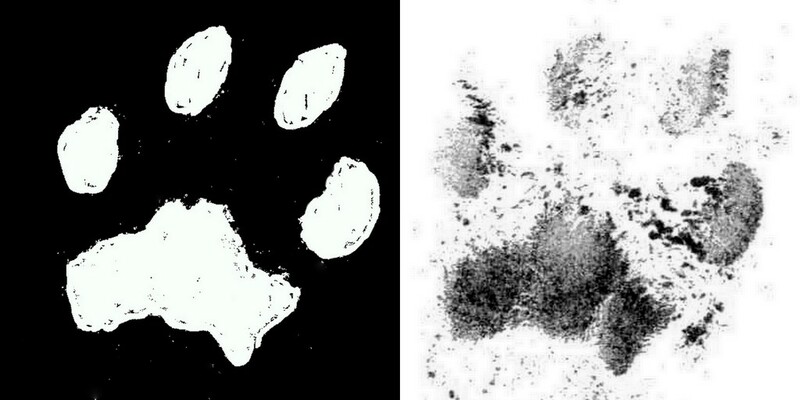 I had the choice of posting back the paw prints to Simply Precious in a stamped addressed envelope, or scanning and e-mailing over the image. I opted for the latter (because I was so excited and couldn’t wait!) and fortunately with a little bit of wizardry on Kelly’s part, she e-mailed me back a proof and checked that I was happy with everything. It’s great to know that she could transform my splotchy attempt into Boop’s unique little paw print! I chose a keyring from the range of jewellery available (which includes charms, pendants and cufflinks) as I’m always off out in the car. I chose to have Boop’s name inscribed on the reverse and now he’s always with me wherever I go! When it arrived (well within the estimated two weeks) I couldn’t have been happier. It was beautifully displayed in a presentation box, and included a rubber stamp which was an unexpected bit of magic. I’ve already bought an ink pad and will be happily signing my Christmas cards with Boop’s paw print from now on! So if you fancy a unique present for yourself, or a loved one – I can thoroughly recommend this wonderful idea. All of the jewellery by Simply Precious is made in their home studio so you can be assured of a lovingly finished product and the customer service was second to none – so much so – that I just had to write and tell you all about it! Have a look at all of their beautiful work on their facebook page or pop over to the website. Enjoy!